Holley Molley what's going on in Two Harbors? FIRES - that's what's going on. In one day we witnessed more boat fires than in 10 years of boating. 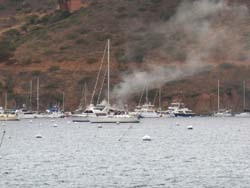 The first fire lit up about 9:00 AM just as I left the Isthmus Cove dock to go scuba diving. I was too excited about the diving to be looking back, but Sharon saw the whole thing. 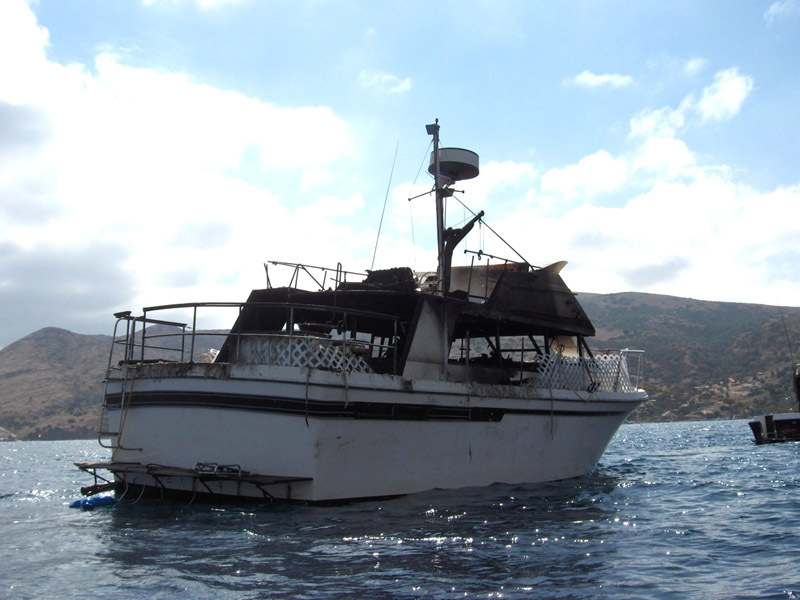 In most coves on Catalina Island, for and aft mooring is the standard. Basically, there are so many boats it is the only way to get them all in. Hence most boaters in the area never get a chance to learn how to anchor. Anyway, the day before we were moored right next to the boat that was to burn. I had commented to Sharon about what a polished beauty she was. We vacated that spot early the next day and put the hook down in the same harbour at Little Fisherman's Cove. One day later the boat that had been next to us erupts in flame. Apparent cause - a propane stove problem. One brave man who refused to give up fighting suffered burns but no other injuries. 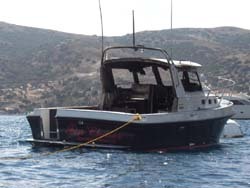 The boat, a beauty - a write off. 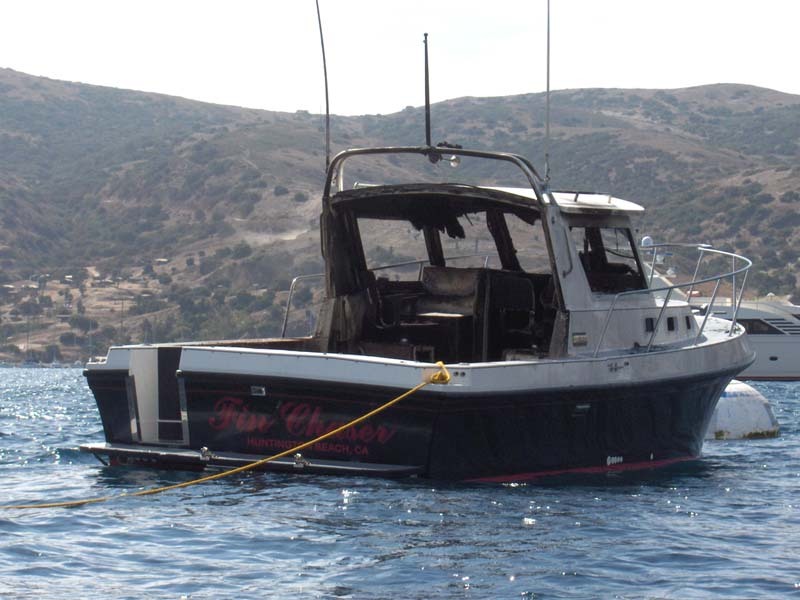 The fire department arrived swiftly and pumped water on the flames almost scuttling the boat. The boat might as well have sunk as it is a terrible mess. The flames were thought to be out, but five minutes later they roared back to life. More water was poured on to dose the flame. 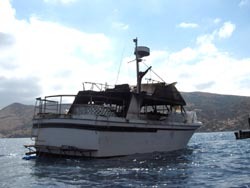 With the boat listing heavily it was towed out of the anchorage. After my dives, Sharon and I are back on the boat relaxing when the sirens start screaming. Big columns of smoke soar skyward on the hillside. Crikey! Twice in one day, really bad luck that is, but at least it wasn't a boat. Once again the fire department swiftly dispatches the flames. But the day is not over. Around 5:00 PM, apparently to much alcohol and smoking combined to ignite the third fire of the day. Again the beautiful harbor is besmirched by a tall colum of black smoke, turning to grey as the fireboat pumps hundreds of gallons aboard in the space of a few minutes. Another power boat up in smoke. Click the pic at the right to see the sad remains. Come on Santa Catalina boaters. Get a grip. NO MORE FIRES! We made it through the next day with no fires. May it be years till we encounter another.